Samford University alumna and current Master of Social Work student Sarah Tarnakow was honored by the National Association of Social Workers – Alabama Chapter (NASW-AL) for the best Master of Social Work student paper. Tarnakow’s paper, entitled “The Use of Child Soldiers in The Lord’s Resistance Army” was initially submitted for assistant professor Rachel Hagues’ class on Human Rights. According to Hagues, she was so impressed with the quality of Tarnakow’s paper, that she encouraged her to turn it into a conference submission. In the paper, Tarnakow focused on bringing to light the issue of child soldiers, highlighted potential solutions, and discussed support that could be given to children who escape this form of exploitation. 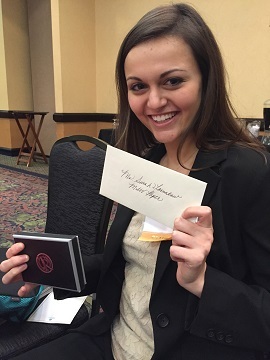 Tarnkow was recognized at the NASW-AL Annual Conference on February 10 in Montgomery, Ala. In addition to receiving the award, Tarnakow had the opportunity to present her paper to conference attendees. Tarnakow earned her Bachelor of Arts in Psychology from Samford and is currently enrolled in the clinical concentration of the Master of Social Work program. She is a native of Vestavia Hills, Ala.
Samford University introduced the Master of Social Work program in 2015. The program offers full and part-time plans of study and Advanced Standing is available for individuals with a bachelor’s degree in social work. Master of Social Work students select a concentration in either Clinical Social Work or Global Community Development. To learn more about the Master of Social Work, please visit us online. Samford University’s Master of Social Work program was admitted to accreditation candidacy by the Council on Social Work Education (CSWE) in June 2015 and is currently pursuing full accreditation. Students who graduate from an MSW program in candidacy with CSWE are license eligible in Alabama; licensing laws vary by state.